2. 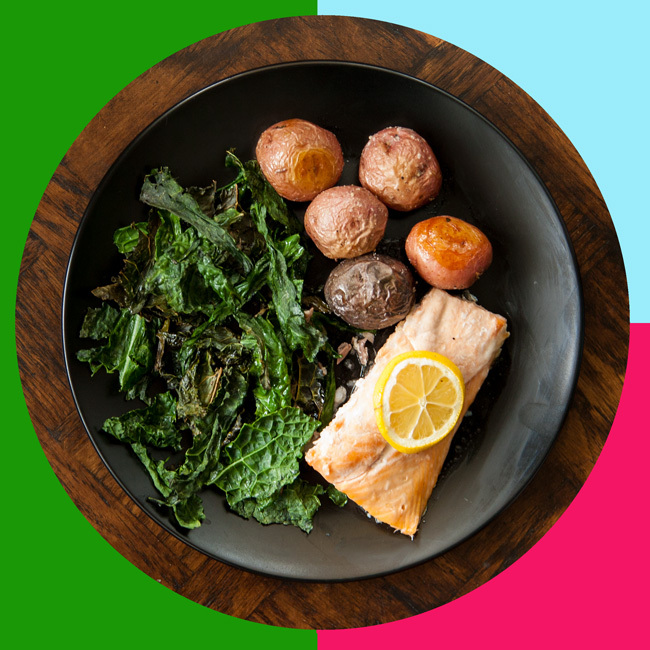 For this last variation, I wanted to be clear that you’re not limited to just potatoes for your starchy vegetable section! This time I sliced up half of an acorn squash, but some other options to add variety to your diet include butternut or kabocha squash, parsnips, plantains or pumpkin. For this Greek-style rendition, toss with olive oil, paprika, dried oregano, and a sprinkle of salt + pepper before transferring them to the oven to start roasting. 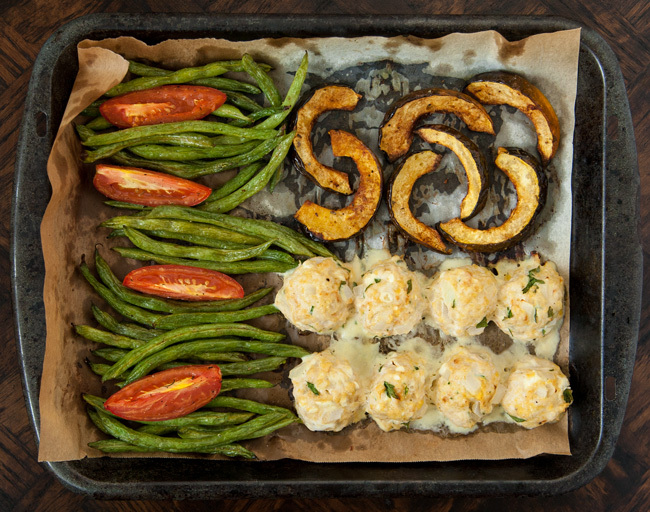 By the way, I know that the actual MyPlate recommendations call for the carb-y quarter of your plate to be covered with whole grains… But starchy vegetables are a good source of nutrients too, and honestly I couldn’t think of an efficient way to make whole grains happen on a sheet pan. 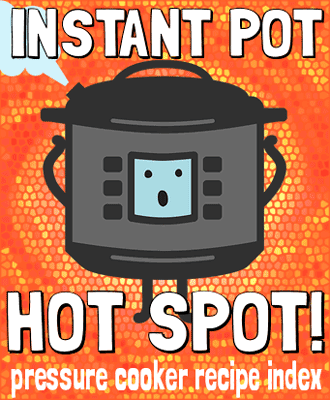 But you can find inspiration for lots of other meals that include whole grains here! 3. 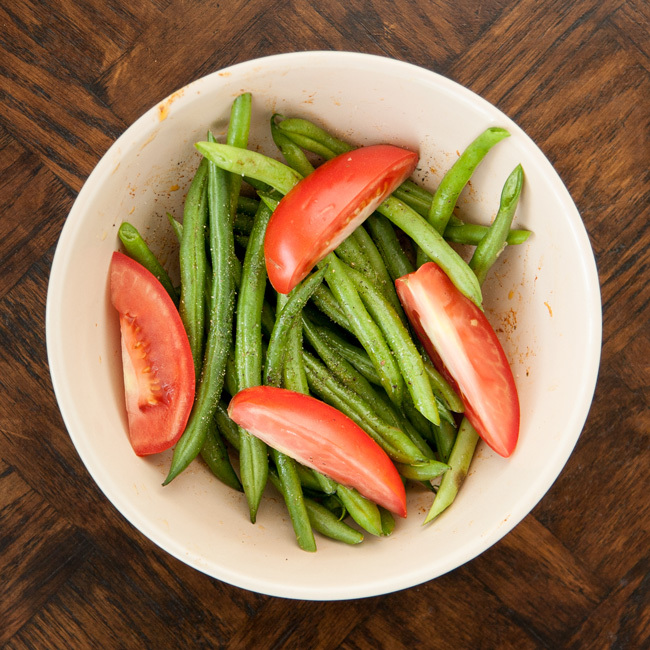 While the squash starts roasting, trim your green beans, quarter a small tomato, and toss them together with olive oil, salt and pepper (this tasty concoction is not entirely unlike the first recipe ever shared on this site). This is also a good time to chop and set aside the onion and parsley that you’ll need in the next step! 4. After the squash has roasted for 15-20 minutes, remove the sheet pan from the oven and spread the green bean mixture over half of the pan. 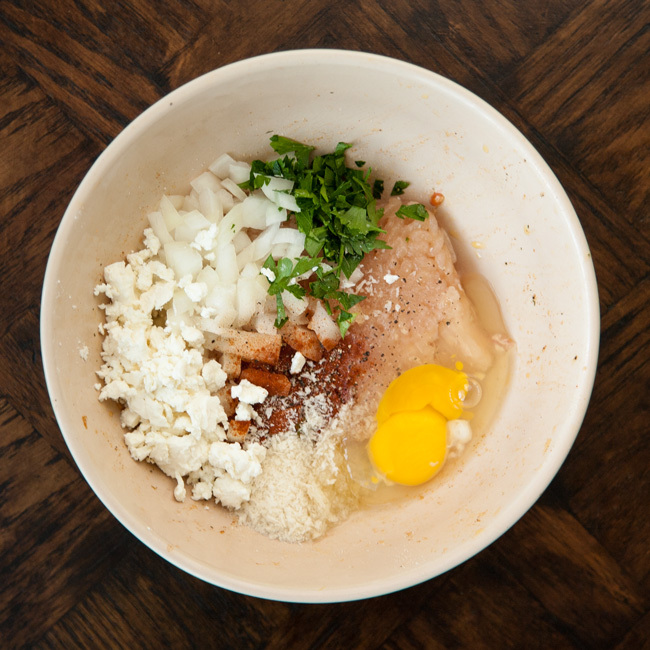 Now that your bowl is empty again, use it to combine ground turkey or chicken breast with onions, parsley, breadcrumbs, an egg, crumbled feta, and a few more sprinkles of paprika, salt and pepper. This is the time to embrace your inner ‘oma’ and gently mix the ingredients by hand and form into 8 equally sized small meatballs to place on the last quarter of the sheet pan before returning it to the oven. 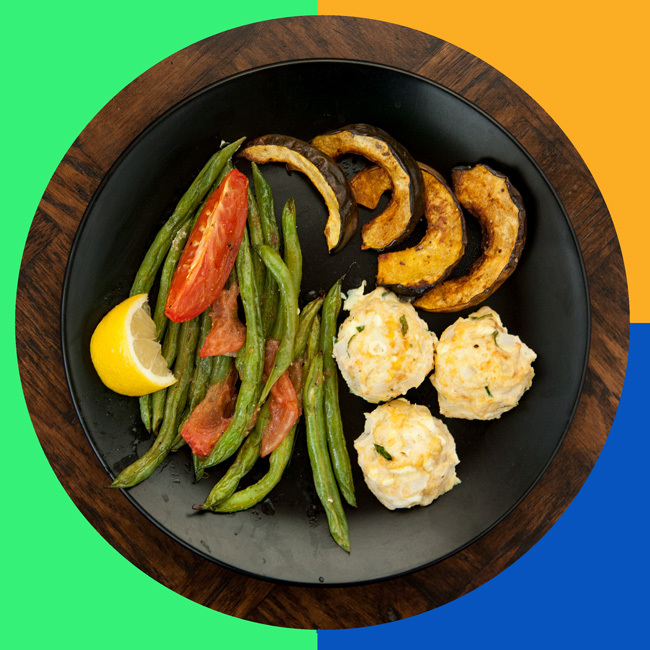 The fresh veggies have their flavors concentrated by the roasting process, and the turkey meatballs are studded with tasty tidbits in every bite. You can either leave the tomato quarters whole, or mash them with a fork to create a sort of saucy dressing for the green beans. Either way, finish with a fresh squeeze of lemon juice for the perfect finishing touch. 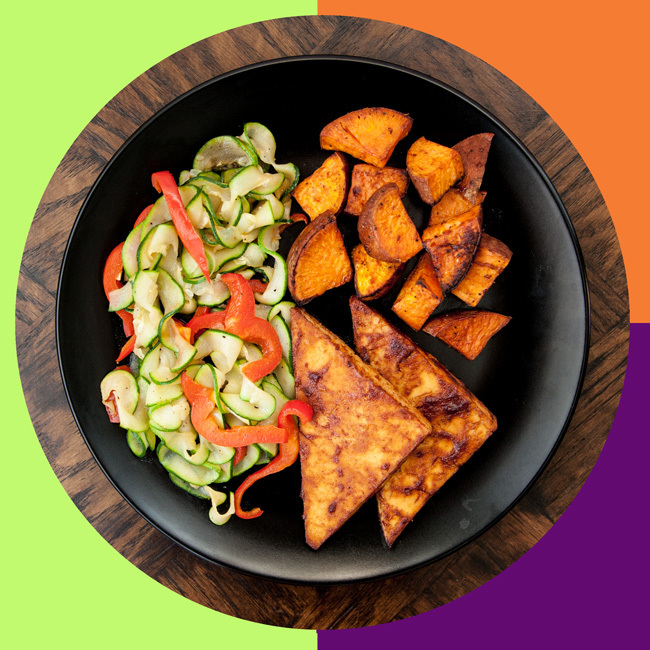 Other MyPlate Bakes in this series:Maple Dijon Chicken // Sriracha BBQ Tofu // SuperFood SalmonI’d like to extend a big thanks to all readers for joining me to celebrate National Nutrition Month!!! 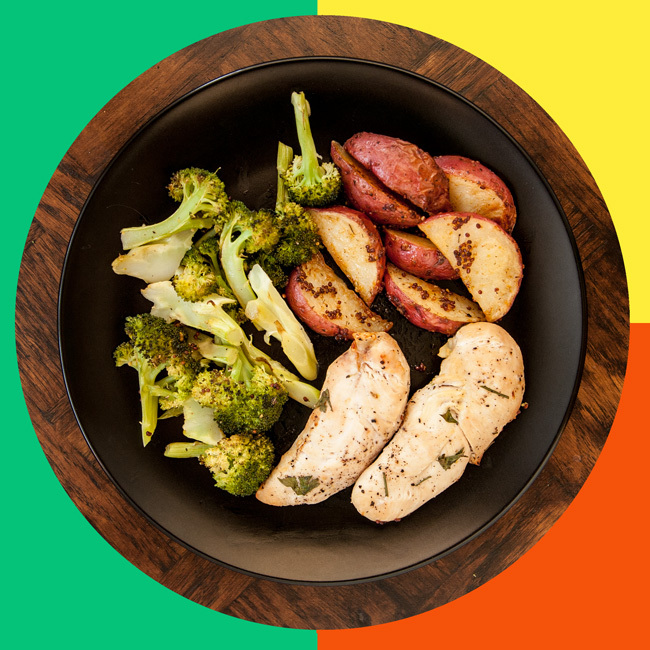 This post wraps up the special series, but by swapping in alternate proteins, veggies and seasonings, the possibilities are virtually endless to create all kinds of new and exciting MyPlate Bakes… What I would love to know is: what combination would YOU put together? Halve the acorn squash, remove the seeds and slice into 1/2 inch wedges. 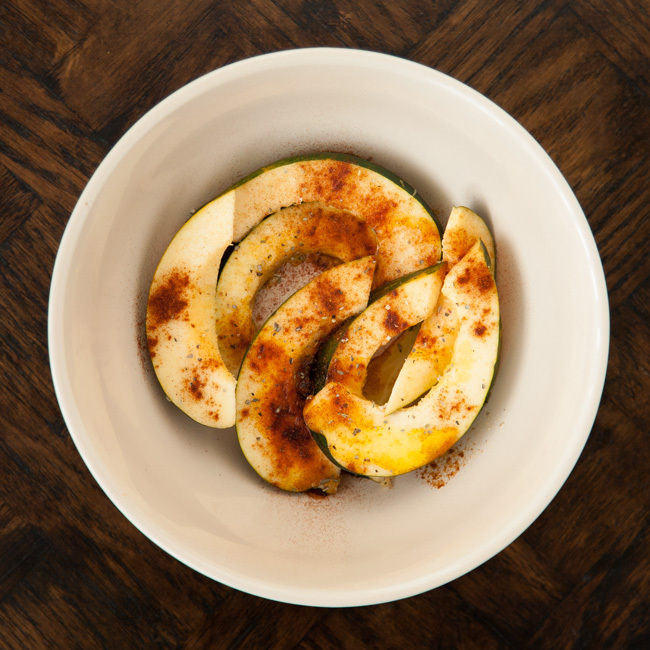 In a medium bowl, toss the squash together with the olive oil and other seasonings, arrange them in a single layer over one quarter of the sheet pan, and place it into the oven to begin roasting. Meanwhile, trim the green beans and quarter the tomato. Toss both together in the same medium bowl with the olive oil, salt & pepper, then set aside. This is also a good time to mince the onion and parsley for the meatball mixture. After the squash has cooked for 20 minutes, remove it from the oven and distribute the green beans and tomatoes over half of the sheet pan. Use the same bowl to gently combine all of the meatball ingredients, and form the mixture into 8 equally sized small meatballs. Arrange them over the last quarter of the sheet pan and return it to the oven for about 20 more minutes, until the vegetables are tender and the meatballs are cooked through. Top the green beans with a fresh squeeze of lemon juice before serving. 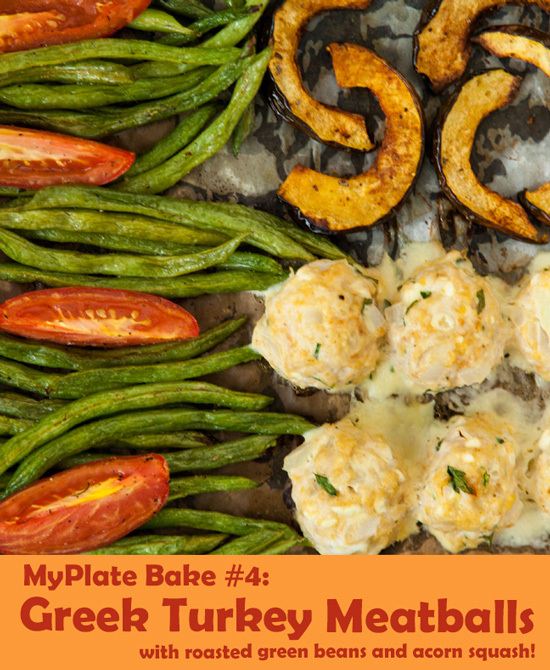 The MyPlate Bake Greek Turkey Meatball etc. recipe is so tasty and easy to prepare. I’ve made it twice in the last month. My husband loves it, too. Thanks for sharing! Wonderful to hear this! 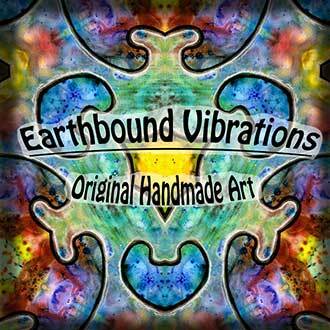 I’m happy it’s been a hit, thank you for the kind words!